Here is an audio that will leave you blown away with how amazing you feel! 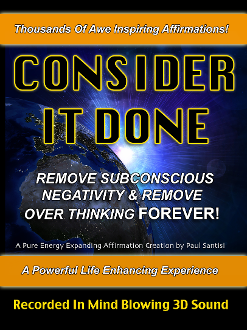 Remove over thinking and negativity for good! Thousands of awe inspiring affirmations in mind blowing 3d sound that will raise your vibrations to new levels. "CONSIDER IT DONE" is the title for a reason. Love who you become!